Huntington Homes, located in East Montpelier, VT, knows the meaning of a cold New England winter and they build homes in their factory to withstand even the harshest weather that Mother Nature can through at them. What a lot of people don't know is that they also set these homes while the wind is blowing and snow is falling. Jason Webster just sent me this time lapse video showing a beautiful new home being set in weather that would keep most site builders home safe and snuggly instead of pounding nails at a jobsite. Jason told me that the front porch will have PV Panels installed later. Notice that the set crew has taped the house wrap during the set. 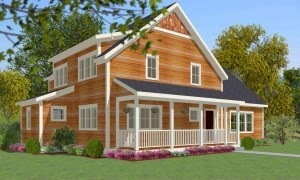 This is the type of weather busting, Hi Performance custom home that Huntington Homes is known for. Sit back and enjoy the show.